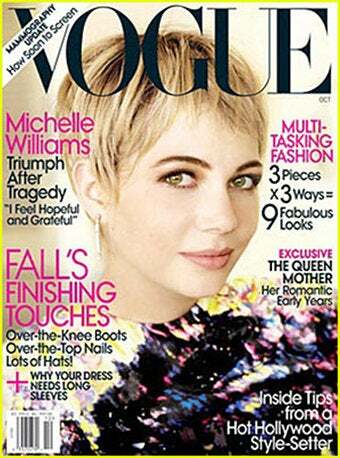 Michelle Williams "Is Like Montana." "She's like Montana. If you want to get anywhere in Montana, you have to sit tight. You're on Montana time. It's very beautiful, but it's vast. If you want to get somewhere with Michelle, you really have to be patient. She's so vast. You really have to sit back and enjoy the view. There's so much going on internally, so much ground to cover." Or, from a costumer friend of hers ("who became Williams's great friend when they bonded over the same navy peacoat by Boy") "So much of her style has to do with the fact that she's a soulful, practical, beautiful kind of person. Can she garden in it? Can she get a bagel in it? Because she's such a lovely, smart person, she looks adorable." Because the actress is understandably chary of revealing too much and highly protective of he daughter's privacy, we get only a dim picture of the poets she likes (Galway Kinnell) and the music she listens to (Leonard Cohen) and, of course, her gamine style, which the author can discuss with less restraint (and which Gosling, apparently suffering from a case of the Francos, describes as "Clint Eastwood meets Brigitte Bardot.") From the miasma of puffy piece and opaque celeb-speak, I could deduce only that Williams is indeed sad, loves her daughter very much, and wants to protect her privacy. Quotes like this - "I wish we had rituals about grief, I wish it were still the Victorian times, and we could go from black to gray to mauve to pink, and have rings with hair in them" - make me want to know more. But when she's ready. And when she can go back to being a person again rather than a personification of our collective grief for someone we didn't know, and she did.